Ok, so this post is about brunches that could turn into lunches. This has nothing to do with interviews by the pool (ode to Biggie). Next time you're looking to meet up with friends and hit up a fun brunch spot, try one of these in Downtown Silver Spring. Let go of Georgetown; you know you end up spending Benjamins shopping every time you Mimosa it up in G-town. U Street has no parking. Arlington is so Arlington. Midtown is where you'll run into everyone you don't want to run into from last night. H Street is so 2011. OK - fine - H Street is actually a really fun street. But venture out. Get out of your shell. Here's a list of numerous options for brunching in Downtown Silver Spring and its proximity. Many have outdoor seating with patios or decks. Lots of options for Saturday brunches as well as Sunday. These spots are all easy to get to right on the red line. 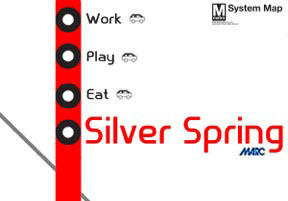 Almost all are walking distance from the Silver Spring metro. Also, parking is free for Downtown Silver Spring on Saturdays & Sundays (garages and street parking). Raspberry, chocolate, & dulce de leche doughnuts made to order that hurt so good. Creperie - every type you can think up. Nutella & Blackberry | Cheese, Avocado, & Tomato | Chestnut Spread & Strawberry to name a few. Chose your plate from the rolling carts. Steam Shrimp Dumplings, Baked Roast Pork Buns, Steamed Bun with Egg Custard to name a few. Sunday Brunch Buffet at $29.95/person. Changes weekly but they always feature a carving station, waffle station, scrambled eggs, oysters on the half shell. Large space for outdoor seating - could accommodate a large party. Large space for outdoor seating - could accommodate a large party - patio out back. Large space for outdoor seating including sand pit. Challah French Toast (orange cream cheese stuffed), House Moulard Duck Ham and Egg Sandwich to wash down with a Kentucky Smoked Peach (Bulleit Bourbon, Peach Brandy, Smoked Peach Nectar, Peach Bitters), Sparkling French Alps (Grey Goose Vodka, St Germain, Elderberry Syrup, Lavender, Sparking Rose), or a House Bloody Mary. About 10 tables or so for outdoor seating. Stuffed French Toast (Strawberry cream cheese mousse, candied pecan and Vermont maple syrup), McGinty's Crab Cake, Irish Breakfast. Bloody Mary Bar - mix yourself. Bloody Marys, Mimosas, and Champagne, $4. Go see the Omelet Man. He's on site cooking up omelets however you like them. Full Service coffee/pastry bar is also available. Take your breakfast outside to the plaza or sit indoors at the window and people watch. Eggspectations - 923 Ellsworth Drive - Every Day - Brunch/Breakfast all day. Pancakes, waffles, crepes, omelets, bagels, yogurt, the works. Good size outdoor patio. In addition to their regular menu they have a Gluten free menu. Chorizo Burrito, Austin Eggs Benedict, Magnolia Eggs (two scrambled eggs on a toasted English muffin with our chile con queso). They also feature "The Hangover Burger". Could go really well with hair of the dog. Sorry no website listed since they don't feature their brunch menu. Smoothies and Juice bar. Maybe they'll spike it? If not, bring a flask. Wait - is that even legal? Don't take my advice on that. The Latin Breakfast looks like an excellent deal: 2 eggs any style, sweet plantain, white cheese, refried beans, and tortilla all for $5.99. The Sancocho de Pollo is not a "breakfast" food, but it will cure any hangover. Filet Mignon Benedict, Crab Benedict, Crab Scrambled, Pancake Triple Stack, French Toast with Caramelized Bananas, Berries, and Grand Marnier Cream Sauce. You get one free Mimosa, Bloody Mary, Bellini, or Screwdriver. Chesapeake Eggs Benedict, Make Your Own Omelet. Make Your Own Bloody Mary Bar. Peach Jalapeno Martini, Blueberry Pomegranate Mimosa to name a few. Numerous omelet options, Whole Grilled Rainbow Trout served with 3 eggs, hash browns, and toast, Chorizo Sausage & Egg Wrap to name a few options. Beer & Wine only. Society Lounge is currently working on their brunch menu and their rooftop space. They hope to have both of those ready to go in the near future. Piratz Tavern will have Gamer Sunday Brunch the last Sunday of the month of April. Sounds like a party. There may be other brunch Sundays in the near future. *Note, these menus, times, and info aforementioned are subject to change. If you're planning a special brunch for your grandma's 80th birthday and you decide on one of the above restaurant specifically because of something I mentioned, please double check with the restaurant to ensure nothing has changed. If there's something or someplace I missed, I want to hear about it! Please respond to this post with suggestions. Also: another bike ride off DTSS: La Casita. Oh yeah - good one. I haven't been there yet. Thanks for the suggestion. I hope to get to it soon!